Take nine diverse landscape photographers, shake them up a bit (metaphorically of course with pre-exhibition nerves), and land them in the inspiring surroundings of the ‘gallery@oxo’ on the South Bank in London, and what do you get? 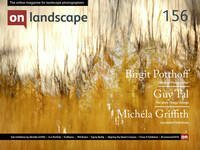 Well, put simply, a wonderful celebration of the love of our landscape, and so many different interpretations and ways of expressing that love in print! If you love landscape photography – or indeed simply love the colours, mood, light and contours of our beautiful world – then this exhibition is well worth a visit. The photographers exhibiting are Astrid McGechan, Beata Moore, Cheryl Hamer, Doug Chinnery, Linda Wevill, Marianthi Lainas, Paul Sanders, Rachael Talibart, and Valda Bailey. No doubt some of those names will sound familiar to you and others less so, but what all these photographers have in common is a deep connection with, and sense of joy in, the landscape, and a distinct style in their portrayal of it. If you venture along to the gallery@oxo, you will find a delightful mixture of landscape photography from intense and detailed abstraction, through to a magical impressionistic world akin to Turner or Monet; from dramatic mono images, wild and emotion-filled seascapes and powerfully minimalist images, through to classic sweeping ‘big vistas’. Additionally, many of the photographers will be at the gallery all week and would like to actively encourage you to come and chat to them, so if you can’t see the photographer in question please do come to the desk and ask. There really is something for everyone at this exhibition, and who knows, you may even discover other styles of work that you like, and which bring you inspiration in your own photography. Vision 9 takes place at gallery@oxo, Oxo Tower Wharf, Bargehouse Street, South Bank, SE1 9PH from April 11th – 15th 2018. Entry is free. Opening times are: 11am – 6pm.